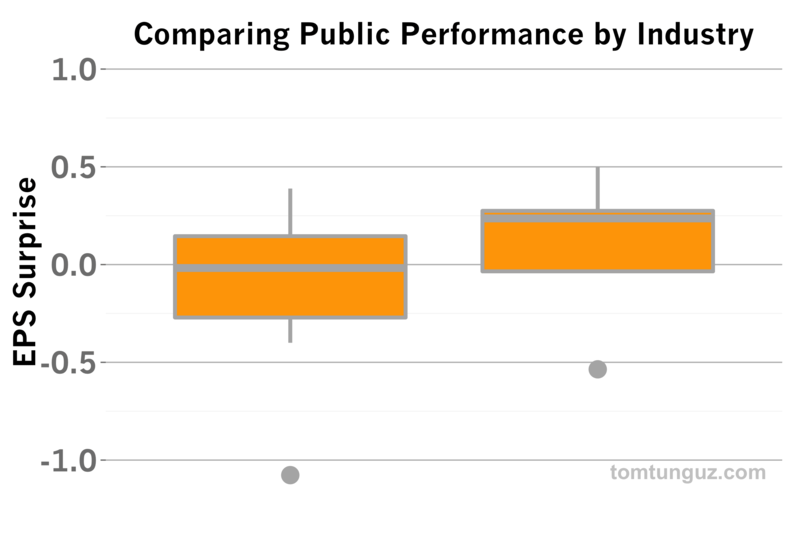 To get a better sense of this, I’ve charted the Revenue and EPS (earnings-per-share) figures for two baskets of public technology companies, a consumer and an enterprise basket. 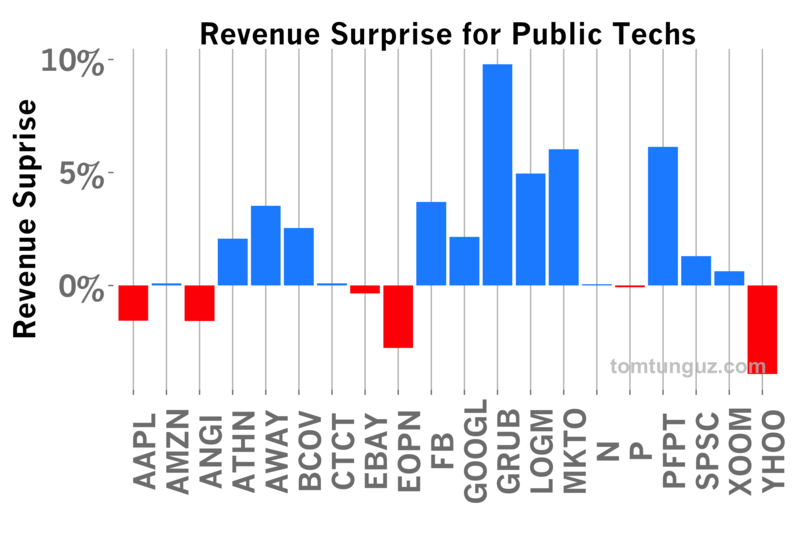 Through the end of last week, about 25% of the public tech companies in these baskets had reported earnings for Q2 2014. I intend to update these charts each week or so, as more companies report to refine the analysis. The chart above shows Revenue Surprise, which is the difference between the revenue reported by the company and the expectations of analysts. Analysts expectations are guided by the company during previous earnings announcements. The theory goes that a well-managed publicly traded company should be able to hit its revenue plan. A company that guides investors to a certain revenue and earnings target and meaningfully misses its target should be concerning. So a positive or zero surprise is a good thing. If many tech companies begin to miss targets, it might be a sign of tougher times ahead. So far in Q2 ‘14, fourteen of the twenty companies exceeded revenue expectations. Yahoo has been the worst miss to date with a 4% miss, but on the whole, the companies who have reported to date seem to be hitting their plans. Looking at Earnings-Per-Share (EPS), half of the companies exceeded their guidance. Amazon is the notable case, missing its target by more than 100% because of greater costs in their core business and significant investments in new businesses like the Fire phone. Aside from Amazon’s outlier, the rest of the field seems to be evenly divided with similar variances. It seems the majority of EPS misses to date are are consumer companies: Amazon, Angie’s List, Google, GrubHub, Pandora and Yahoo. Looking at the data by industry, the initial data shows that on the whole, enterprise companies have been outperforming their earnings targets by 25% (median), compared to 0% for consumer. This could be an indication of unanticipated strength in the enterprise market or greater predictability of those businesses, but it’s worth more research to determine if that’s truly the case. 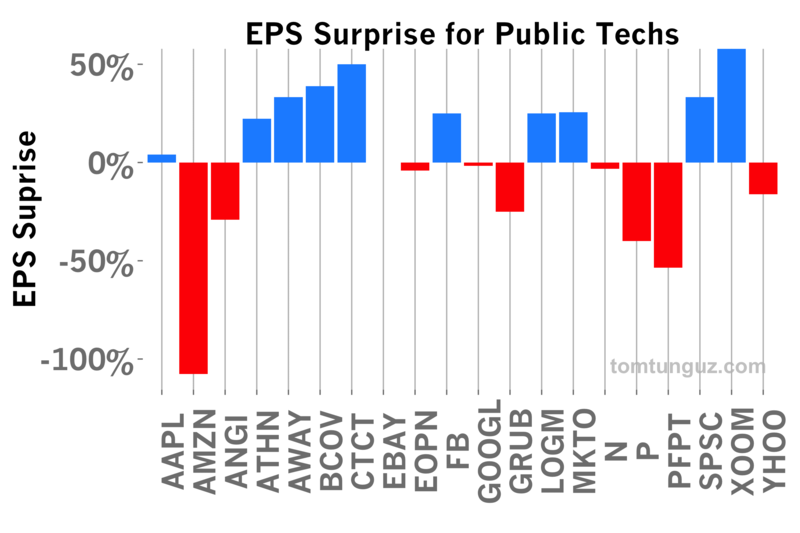 So far, the public technology companies that have reported earnings seem to be able to achieve their targets, with a handful of negative earnings outliers. I’m curious to see how the rest of the earnings season unfolds.